This film is a very untypical Patlabor film. First up it's more of a side story. The SV2 are hardly seen in the film (their total contribution takes up less than 15 mins). The two detectives and Saeko Misaki are the main characters and the focus of the story. Also the labor action is mostly left to the last 15 minutes of the movie, and hardly any labors are seen during the film. It's basically a detective mystery with a monster film sub-plot. Most of the monster sub-plot seems very similar to the 1989 film "Godzilla Vs Biollante", which also involved a scientist using cancer cells from his dead daughter crossing them with a rose to create a monster. Being that it is set in 2000, the film takes place two years before the events of "Patlabor 2 the movie", and strangely two years before the film's actual release date in Japan. The film's story is based upon the Patlabor manga story "Waste Product 13" (sometimes known as "Wasted 13"), which is complied in volumes 7 to 10 of the Japanese graphic novels. Unlike the film, this part of the manga was heavily based around the Special Vehicles Unit 2, Schaft and the Griffin. The detectives, Shinichiro Hata and Takeshi Kusumi do not appear in the manga at all. The members and staff of the Toto Medical Laboratories, Saeko Misaki, Toshiro Kurusu (the director), and Shizuo Miyanomori (the male research scientist) all have major roles in manga. The ending is also quite different when compared to the film. This movie is probably the most delayed production in anime history. Many fans thought it would never be made. Work began on this film in 1994. At this stage it was to become a direct to video animation (Original Video Animation or OVA). In this early stage it was decided that it would not be called Patlabor as it was a 'side story' and didn't involve the SV2. As production progressed it was changed to a movie format and the Patlabor title was re-instated. The film was finally announced as "in production" to the public in October 1997. It was due for release in 1998, but the studio Triangle Staff who was meant to animate the film went bankrupt before production could start. Animation duties were eventually given to Studio Madhouse who finally began production on the film in 2000. The film eventually premiered at Tokyo International Fantastic Film Festival on 10 December 2001, but wasn't released in cinemas until March 2002. The Pilot Film from 1997 mirrors almost all the scenes from the film so closely, it almost looks like they used the same animation from the film. This suggests that not much was changed to the script between 1997 and when to went into it's production nearly three years later. Maiden Japan released the film in the US on Blu-ray and DVD with an English dub, original Japanese dialogue and English subtitles, and the “Minipato” shorts as extras. In Japan the movie is available on on DVD and Blu-ray with English subtitles from Bandai Visual/Emotion. The Maiden Japan DVDs and Blu-rays are only available in the US, and therefore will only work on DVD/Blu-ray players that are both NTSC compatible and will play region 1 DVD discs and region A Blu-ray discs. The Bandai Visual/Emotion DVDs and Blu-ray discs are only available in Japan and will only work on NTSC compatible and region 2 compatible DVD players and region A Blu-ray players. If you don't live in these countries, check your player's instruction manual to see if it will play the discs. Please see the English Language Movie Releases Video List for a complete listing of all releases, formats and product specifications for this movie in English. This movie is available in Japan from Bandai Visual/Emotion on DVD and Blu-ray disc. These discs do not come with an English dub, but do have English subtitles. These discs are only available in Japan, and therefore will only work on DVD and Blu-ray players that are both NTSC compatible and will play region 2 DVD discs and region A Blu-ray discs. If you don't live in Japan, check your player's instruction manual to see if it will play the disc. Please see the Japanese Movie Releases Video List for a complete listing of all releases, formats and product specifications for this movie. A GWEI Product. ©2003 - 2018 GWEI. 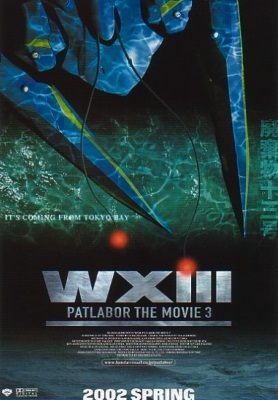 WXIII Patlabor the movie 3 ©2002 Headgear/Emotion/TFC. All other logos/trademarks are copyright of their respective owners/companies. Used for review and illustration purposes only.